Welcome to Weekend Watch, a recurring feature where we highlight some of the best geek-related videos around the web. Whether it’s short films, behind the scenes videos, video essays or top 10 countdowns, the only requirement is that they are about–in some shape or form–our favorite geeky topics! In this jumbo-sized edition of Weekend Watch, we will take a look at all things related to the upcoming animated feature film, Spider-Man: Into the Spider-Verse. This time around, we’ll start off with a quick refresher on the origins of the various spider-people that make their big screen debuts in the film. After that, we’ll take a look at a hybrid trailer for the film, a couple of behind the scenes featurettes and 5 clips from the film itself. Plus, we have a great Q&A with the filmmakers and cast, a fun video essay about which character in the movie will be the most important and an Easter egg breakdown of the most recent trailer. Now, let’s jump right into Weekend Watch! 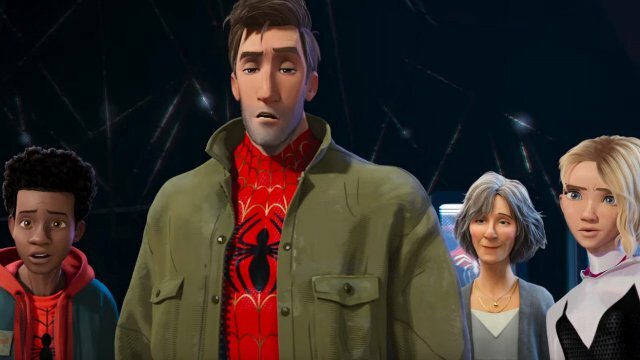 Although we covered the origins of the various characters in Into the Spider-Verse last weekend, here’s a quick refresher. This video by Key Issues takes a look at four of the film’s major characters: Spider-Man Noir, Peni Parker, Spider-Ham, and Spider-Gwen. What’s great about the inclusion of all these characters in the film is how they each represent a slightly different animation style and visual perspective. With so many great spider-people making their first appearances on film, lets hope that they all finally get their due on the big screen. Next, we have a Frankenstein “trailer” for Into the Spider-Verse that puts an emphasis on its characters. Coming from Comicbook.com, this hybrid trailer that incorporates an international featurette and a few TV spots. Focusing on the various characters in the movie, this video will give you a quick rundown of the major characters in the film. We also get a few new tidbits of footage in this trailer, along with some new character interactions and dialogue. Nothing surprising here, but if for some reason you haven’t seen any of the trailers it’s a quick way to get caught up to speed on what the film has to offer. Even though this behind the scenes featurette is all-too-short, it does give a bit of insight into the animation style behind Into the Spider-Verse. The featurette, which comes via GoodOrBad Trailer, takes a look at how the filmmakers accomplished the groundbreaking animation style used in the film. It’s fascinating to see how the filmmakers were able to incorporate the language of comics into the animation style of Into the Spider-Verse. Aside from the way that the animation lends to a more comic book inspired style, it’s also wonderful to see how they incorporated elements such as caption boxes and onomatopoeia into the film. If there’s anything wrong with this featurette, it’s that it barely scratches the surface of how this unique animation style was created. In this 5 minute B-roll for Into the Spider-Verse, we get a great look behind the scenes as the actors record their lines. The video, also from Comicbook.com, gives small snippets of the actors’ recording sessions while the finished clip plays in the background. It’s an interesting way to present what normally is a pretty mundane thing to watch, especially when you have nothing to compare it against. The highlight here is obviously Nicholas Cage — who of course goes full method by showing up in a suit while using an accent reminiscent of the 1930’s. Up next, Sony has provided 5 clips from Into the Spider-Verse to promote the impending release of the movie. The film has garnered a lot of praise from its early screenings. Not only does this clip reflect the self-aware tone of the marketing, but it also shows off the unique animation style. It’s a great look at the mentor role that Peter takes on in the film, but Miles seems to be perfectly captured here. In this lengthy 30-minute Q&A from Sony, we finally get the full cast, writers/producers and directors all in one spot. Moderated by IGN’s Terri Schwartz, this special Q&A covers a ton of information about everything involved with the making of the film. Indeed, there’s a ton of insight here. What’s most impressive is all of the love and care that the filmmakers had for for these characters. In other words, it’s easy to tell that everyone involved saw this movie as a passion project. This interesting video essay from Wulff Den argues why the most important character from Into the Spider-Verse is none other than…Peter Porker, a.k.a. Spider-Ham. Essentially, the video is arguing that by including the character of Spider-Ham, the filmmakers are embracing what is easily the silliest side of the Spider-Man mythology. In doing so, the movie isn’t taking itself seriously while also being faithful to the source material. In other words, the movie can respect the Spider-Man mythology and still have fun within that sandbox. It’s true that Into the Spider-Verse has the ability to be a game changer in many ways. It’s just a matter of if audiences are willing to accept what the film is ultimately shooting for. Our final video from New Rockstars comes with a big, fat potential spoiler warning. Although this Easter Egg trailer breakdown is largely speculative, there are likely elements of the film discussed that will end up being spoilers in this video. With that said, this video does a deep dive into the trailer from October. There are several little details that appear in the trailer, but the most impressive are perhaps the subtle differences between Miles and Peter’s dimensions in the film. It’s also interesting to note the addition of Spider-Man Noir’s hat in the film version of the character. Finally, the nod to Insomniac’s take on the character is also appreciated (see background of image above). While there are tons of great surprises in here, the film itself is sure to have countless references to explore once it is finally released. What did you think about these videos? Let us know in the comment section below!